WASHINGTON — A longtime aide to Hillary Rodham Clinton said Friday she answered all questions posed by the House Benghazi committee after a daylong meeting behind closed doors that Democrats said was unnecessary. 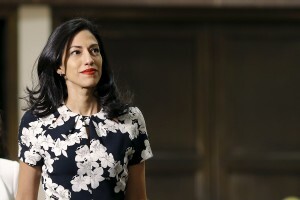 Huma Abedin said she answered questions “to the best of my ability,” adding that she tried “to be as helpful as I could be to the committee” investigating the 2012 attacks, which killed four Americans, including U.S. Ambassador Chris Stevens. Abedin, committee staff and a few lawmakers met behind for nearly eight hours Friday at a session focused on the Sept. 11, 2012, attacks. Clinton, the front-runner for the Democratic presidential nomination, is scheduled to appear before the panel on Thursday in a widely anticipated public hearing. Rep. Lynn Westmoreland, R-Ga., said questions to Abedin focused on the Benghazi attacks, but also touched on Clinton’s use of a private email account and server while serving as secretary of state. “If it had something to do with Benghazi and an email then that was asked. If it wasn’t about Benghazi, it wasn’t asked,” Westmoreland told reporters. The decision to question Abedin angered the panel’s top Democrat, Rep. Elijah Cummings of Maryland, and the Clinton campaign. “She had no policy responsibilities, no operational responsibilities and was not with Secretary Clinton on the night of this phenomenal tragedy,” Cummings told reporters after breaking away momentarily from the day’s proceedings. In a statement, the campaign suggested that calling Abedin as a witness was a fresh sign of the panel’s partisanship. “The committee’s focus on Huma (as opposed to numerous intelligence and defense community officials still outstanding) is additional evidence that the actual attack in Benghazi, and its lessons about how we might better protect diplomats serving in dangerous places, are the last things on the committee’s mind,” said Nick Merrill, a campaign spokesman, in a statement. Republicans have defended the panel’s investigation as the committee comes under intense scrutiny after two House Republicans described its work as partisan and aimed at hurting Clinton’s presidential bid, a characterization the panel’s chairman rejects. Rep. Trey Gowdy, R-S.C., took the unusual step on Thursday of chiding a fellow Republican, who said the investigation was designed in part “to go after” Clinton. Gowdy said the comments by Rep. Richard Hanna, R-N.Y., were “unfortunate” and misinformed. Hanna is not a committee member. Democrats, who have complained about the $4.5 million, 17-month probe, have seized on McCarthy’s comments. “When you have the No. 2 person in the Republican Party … to tell you this is all about a taxpayer-funded political effort to derail the campaign of Hillary Clinton, ladies and gentlemen, that is a problem,” Cummings told reporters. An official who was not authorized to speak about the proceedings and spoke on condition of anonymity said Abedin would likely not be questioned about her employment status at the State Department or her work for the Clinton Foundation or a consulting firm with ties to former President Bill Clinton. Gowdy was in South Carolina on Friday and did not attend the session in which committee staff and attorneys questioned Abedin. Republicans Westmoreland and Rep. Mike Pompeo of Kansas did attend the meeting, as did Cummings. Asked about Gowdy’s absence, spokesman Jamal Ware said, “no particular reason,” and later added that the chairman discusses the questions with staff in advance and trusts his colleagues to pursue them.